According to radiocarbon test results, the Fuhe River Culture was also a settlement dating back 5,000 years. The villages of the Fuhe River Culture were situated on hills or highlands, facing the sun. For example, the settlement at Fuhegoumen, consisted of over 150 houses or over 41 houses. The houses were mainly square, but some of them were round. The soft pottery of the Fuhe River Culture was all with sand inclusions and was not treated by high temperatures. The surface of the pottery was brown, with the largest portion of them being tan. Whether or not there were patterns on the surface of the pottery, they were all ground. Most of the patterns were pressed and the ones found most often were horizontal Z-shaped patterns, while others were vertical Z-shaped patterns. 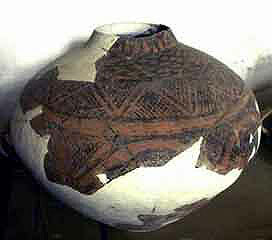 The stoneware found at the Fuhe River Culture site was mainly made by knocking. It was regular and fine. Stoneware for chopping and smashing accounted for the biggest share. The production tools found in Fuhe River Culture were mainly stones and bones. Bones were used to make arrowheads, knife handles, needles, fishhooks, fish darts and toothed bones. Many animal remains were found at Fuhegoumen, including those of wild boars, deer, gazelles, foxes, squirrels and others. Marks resulting from processing were left on them. The remains were mainly discarded raw materials, semi-finished articles and broken bones. In addition, auspicial bones were found at Fuhe River Culture sites. These deer or sheep blade bones were burned, but not bored or chiseled and thus remained unchanged. They are the earliest auspicial bones to be found in China so far. Fuhemenggou relics reflect the then mountainous and forest areas in which the culture existed. The ancient people of the Fuhe River lived in settled villages, and used tools to dig the earth and grind corn. This indicated that a primitive agriculture was developed in the culture. The large number of captured wild animals and fishing and hunting tools showed that fishing and hunting were an important part of their life.